Looking to move to the fast growing Championsgate area? Check out Windwood Bay. This expansive, open design, 4 bedroom 3.5 bathroom (2672 SF) two story vacation home is in a well-established community with a mix of residential and vacation/second homes. Enjoy your private, screen-enclosed, heated pool and in ground spa complementing a large deck area for relaxation, sun bathing and entertaining with no direct neighbors in the back. Spacious and fully equipped kitchen with oak wood cabinets, ceramic tile flooring, breakfast bar. There are spacious sized living and dining areas, plus a separate expansive family room adjacent to the kitchen with sliders to the pool deck. 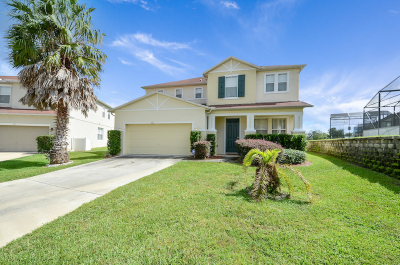 This home has large master suite with wall to wall carpet and walk in closet and master bath that features garden tub and separate shower, ceramic tile floors, vanity sink. There is a second master suite with its own bath. Secondary bedrooms share a full bath. Ceiling Fans. Inside utility room. Oversize 2-car garage has finished epoxy floor and is setup as a game room. Close to Publix, Champions Gate shopping with easy access via I-4 to Walt Disney World and all attractions. Can continue to be used as a vacation home or is also perfect for long-term rentals or permanent residents. For investors – this home can come with advanced bookings through the Springtime and as a holiday villa rental.